Packard had survived the Great Depression by doing what major “Three Ps” competitors Peerless and Pierce-Arrow could not do, and that was to build a new factory, design a new car from the ground up and introduce mass-production techniques for a mid-priced automobile to be built alongside the “senior” cars introduced as the 120, as 1935 cars. Paradoxically for Packard, the savior “cheaper” cars became the millstone over time by diluting the prestige of the marque. Before the Second World War, Packard was still building senior 356 cubic inch inline-eight cars separately from the smaller cars, which ran much smaller inline-sixes and inline-eights of 245 and 282 cubic inches, respectively. To further their competitive condition, Packard commissioned Howard “Dutch” Darrin to develop a new line for mid-1941 introduction known as the Clipper. Bodies were not produced by Packard but contracted to Briggs Body in Detroit in order to save costs. They sold very well, and the cars were brought back postwar and ended up as the basis for all Packard cars, both “junior” and “senior”, with larger cars having longer front ends for the massive 356 inline-eight. This meant that all Packard bodies were now sourced by Briggs, except for commercial hearse and ambulance. As with all other manufacturers, Packard was able to sell any cars they were able to produce in the immediate postwar years. Utilizing the more modern and better looking Clipper styling for all cars saved money and modernized the styling of the senior cars at minimal cost. It also allowed for all cars to be produced on one assembly line. By the time these Eights came along, the competition was bringing out new cars with new styling, and Packard was at a disadvantage. Packard therefore reskinned the cars below the greenhouse to eliminate the vestiges of fender sweeps. The cars looked bulbous, yes, but the massive look was definitely in for American buyers. 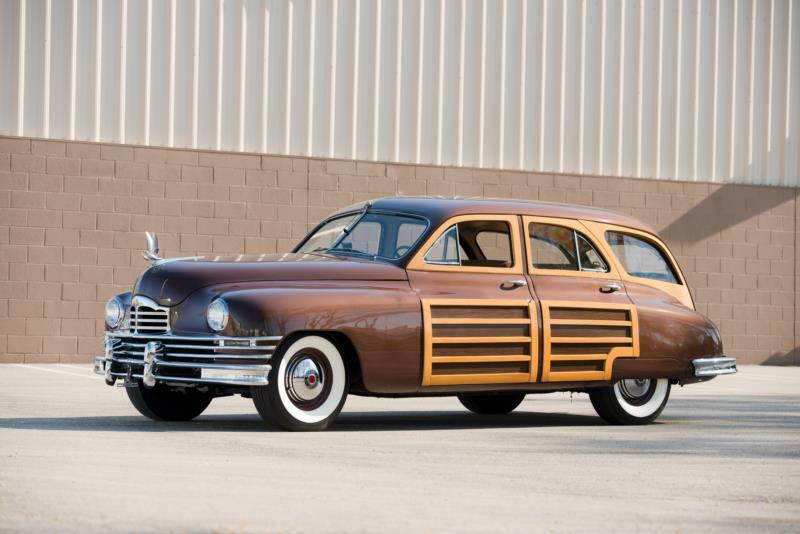 These 1948-50 cars gave Packard financial breathing room until all-new cars could be developed for 1951, but even though they were a stopgap measure, they are respected now. The Eight and Deluxe Eight lines had 288 cubic inch engines throughout the three year production, rated at 130 hp in 1948 and 135 hp thereafter. These cars rode a 120-inch wheelbase as used on the prewar and postwar Clipper cars which preceded them. The Super Eight line had 327 cubic inch engines throughout the same period, rated at 145 hp for 1948 and 150 hp thereafter. These cars utilized a 120-inch wheelbase for 1948 and 127 inches from 1949 on. A long-body seven-passenger sedan and limousine was offered on 141-inch wheelbase. The senior Custom Eight line had the massive nine main bearing 356 cubic inch engine, rated at 160 hp. The 127-inch wheelbase and long nose was used out of necessity. 148-inch wheelbase seven-passenger sedans and limousines were also supplied to order for 1948. 1949 was Packard’s Golden Anniversary year, and the company produced 2,000 cars in custom gold paint. Top of the line Custom Eight convertibles ran an eye-popping $4,295 for 1948, with prices gradually moving up to $4,520 by 1950, when a mere 77 examples were built. 1,013 were built in 1948, 213 were built in the first series of 1949 cars and a mere 68 were built in the second series of 1949 cars. Another rare Packard built from 1948 to 1950 was the Eight Station Sedan, a station wagon that sold new for $3,425 in 1948 and featured mostly metal bodywork with some wood structure in the upper rearmost body and tailgates. Alterations in mid-1949 for the second series cars included larger rear windows on some cars, trim changes, and oval taillights as well as the Ultramatic transmission. This was the only automatic transmission ever developed entirely in-house by a US auto company other than the “Big-Three”, and for its time it was highly advanced. The lock-up clutch on the torque convertor solved several issues. It improved highway fuel economy to match a synchromesh car and it kept transmission oil temperatures down. The clutch could engage as low as 15 mph, but given the normal driving style of the day for cars such as these and the prodigious low-engine speed torque of the Packard eights, this was no real disadvantage. In the manner of Buick’s Dynaflow and the original Chevrolet Powerglide, the Ultramatic torque convertor initially did all the work in normal driving. There was no shifting of gears. There was also an “emergency low” gear range, which could be selected by hand lever with no need for a clutch pedal. Smooth progress was the watchword of the day, and the unit proved to be reliable. It had been under development since 1935, and Forest McFarland and his engineering team at Packard had characteristically driven all the bugs out of it before allowing it to be introduced to the public.